Revell Research Systems is based at Exeter (in Devon) in the South West of the United Kingdom. 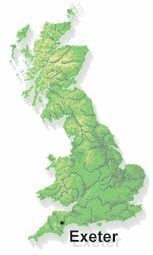 The practice can provide its IT and computer consultancy services to any organisation in England, Scotland and Wales and most organisations in Northern Europe. Our IT and computer consultants work across the country and beyond. Exeter (in Devon) is well situated, with access for our IT and computer consultants to the rest of Great Britain by motorway (M5), two rail routes to London and its own international airport, which offers direct flights to Paris Charles de Gaulle and other European destinations, with onward connections. The rail service to London Waterloo is also convenient for EuroStar connections to Paris and the rest of Europe. The city has many resources, including the University of Exeter. Exeter is the capital of Devon and is well placed for a computer consultancy to service Plymouth and Torquay as well as the surrounding counties of Cornwall, Somerset and Dorset. Exeter has a growing reputation as a regional capital for technology, which has been boosted with the arrival of The Met Office.